Medical staff members conducted ophthalmic examinations free of charge for residents of Xingguang Community in Baotou, in North China’s Inner Mongolia autonomous region, on April 8. Pei Xiaodong, chief physician at the Department of Medical Affairs at Baotou No 4 Hospital, gave a lecture on March 15. 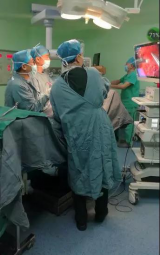 Han Bo, director of Cardiothoracic Surgery Department at the Inner Mongolia Baogang Hospital, recently successfully performed a thoracoscopic lung cancer surgery for a Mongolian patient called Ganbileg, according to a Jan 24 Baotou Daily report. Baogang Hospital has recently launched an air rescue center in cooperation with Kingwing Aviation, according to Baotou Daily. The stomatology department of the Hospital of Inner Mongolia First Machinery Group officially became Baotou Stomatological Hospital affiliated to Inner Mongolia Medical University on Oct 26, according to Baotou Daily. The Baoyi International Hospital Project is progressing smoothly with the main body of the first phase already complete, according to Jiuyuan district’s development and reform bureau. Baotou Central Hospital and the Second Affiliated Hospital of Baotou Medical College are to start building trauma treatment centers, thanks to agreements signed with China Trauma Treatment Alliance, according to a Sept 3 Baotou Daily report.